Given the success of Netflix’s Daredevil, the series quickly saw a second season ordered as many began wondering what’s next for the Defenders on the streaming service. Daredevil‘s initial showrunner Steven S. DeKnight (Spartacus, Angel) has already expressed a desire to see Daredevil ally-in-conflict Punisher given a similar dark treatment on Netflix as rumor has it Punisher is already planned for a second phase. Certainly, the world crafted in Daredevil makes an ideal environment for the character to be adapted and given Daredevil’s redemption from his 2003 film, fans believe in the same hands the Punisher can similarly be saved. Lets examine what a Punisher series could entail in the Marvel Cinematic Universe, specifically in the Defenders subset on Netflix, while expressing some SPOILERS from Daredevil. If you’re talking about Marvel, chances are you’re talking about New York City. From Spider-Man’s home in Forest Hills to Doctor Strange’s Sanctum Sanctorum in Greenwich Village to Daredevil’s territory in Hell’s Kitchen, New York goes beyond a mere setting and becomes a character in almost any Marvel story. Arguably, this is most true for Punisher as the closest the character has to any boundaries is in trying to stamp out crime in the Big Apple (though, this certainly isn’t always true as he’s infrequently gone international). In taking on the likes of the Mafia, Bratva, Triad, Yakuza, and more, the Punisher spreads his war zone across the entire city. As Daredevil revealed, the paradigm of power in organized crime shifted with the Battle of New York from The Avengers leading to the rise of power of Wilson Fisk. 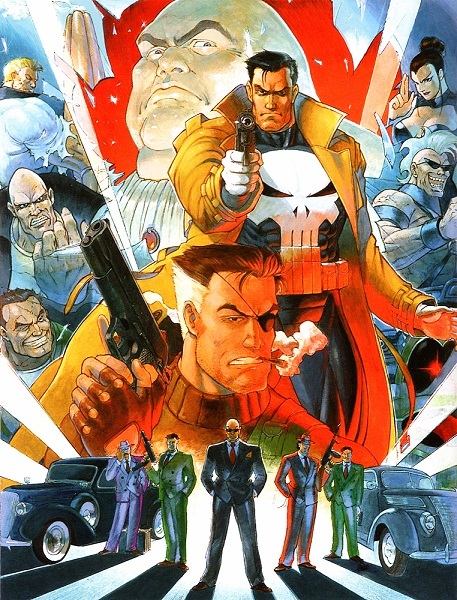 Daredevil was set eighteen months after the Battle (roughly around the time of Thor: The Dark World) which leaves a wide berth for when a Punisher series could take place (i.e. before, during, or after the events of Daredevil). What could be interesting is to have Punisher take place during the events of Daredevil where the conflict between Fisk and Daredevil could have indirectly created the Punisher. One of the key elements of Daredevil was the parallels between Wilson Fisk and Matt Murdock. In both instances, the men were shaped by their fathers and a desire to improve life in Hell’s Kitchen based on those parental inspirations. The origins of the Punisher is firmly set around family. A marine in Force Recon (Special Forces), Frank Castle was on leave with his wife and two children having a picnic in Central Park when they unfortunately witnessed a mob hit. Having seen too much, they were gunned down with Castle being the sole survivor. Thanks to dirty cops in the mob’s pocket, those responsible avoided justice leading to Castle undergoing a psychological break. 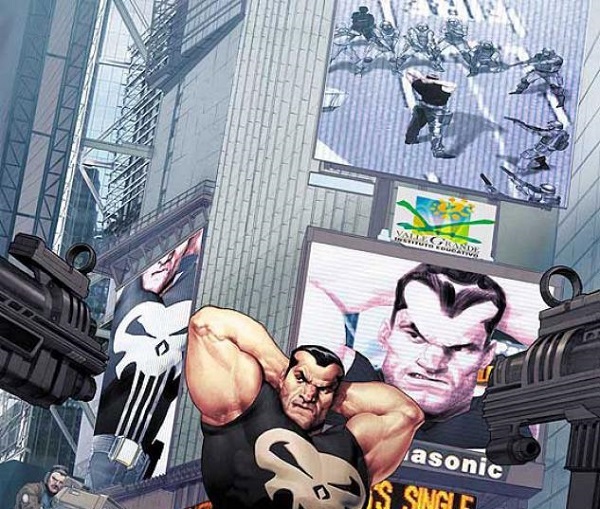 Going AWOL, Castle declared war on crime as the Punisher, a sadistic psychopath who weaves between violently combating lawbreakers and spreading the suffering and torment he himself suffers at the loss of his family. 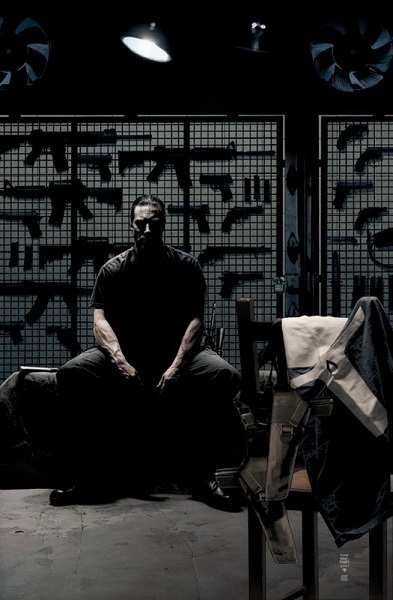 To become the Punisher, Castle had to kill the part of himself who was a husband and father and transform into a nigh-soulless killing machine. However, considering taking up arms against crime directly came from his loss of family, he can hardly deny despite everything, he merely buried his heart under all that pain and anguish. To an extent, this inner turmoil had a light shined upon it by the addition of David Linus “Microchip” Lieberman to his cause. An uncle to a nephew who lost his life upon crossing Wilson Fisk, Microchip (or Micro for short) sought vengeance and found an ally in the Punisher. A brilliant hacker, inventor, and machinist, Micro became an invaluable asset to Punisher however the duo clashed over execution of tearing down Fisk’s empire. Micro found using his own methods, he could make life difficult for criminals and employ Punisher like a scalpel to eliminate high profile targets. However, Punisher preferred the hammer approach which generated a mountain of corpses. Micro felt his ally simply wanted to inflict pain as Punisher saw his partner as a soft hand in a hard world. Similarly, when the Punisher met Daredevil, the latter saw the former as someone who simply wanted to kill and create misery. Despite sharing a common foe, the pair generally fought whenever they met because their methodologies were so drastically different. With the groundwork set in Daredevil, arguably the Punisher’s greatest foe in Wilson Fisk is already established. Further, another Daredevil sparring partner that infrequently battles Punisher in Bullseye may have already been set-up for the second season of Daredevil. The Punisher has had many foes over the years, several deriving from Daredevil (like Bushwacker), but considering his take-no-prisoners approach to crime, few return. One notable such villain was Burt Kenyon, aka The Hitman, a friend and comrade of Frank Castle who served together during war time. Returning stateside, Kenyon found work as an assassin bringing him into conflict with his old friend. It provided a rare instance where the Punisher was tempted to capture rather than kill his enemy. Another conflicting opponent was Saracen, a mercenary who at times had been an ally and at other times an enemy to the Punisher depending on who his client was on the occasion. Developing something of a rivalry, they would eventually have a final battle. Likely the Punisher’s greatest foe beyond Fisk would be Jigsaw. A hired gun for the mob, Billy “The Beaut” Russo was contracted to take out the Punisher only to have his face shoved through a glass window for his troubles. Having survived but his beautiful face mangled into a patchwork of clumped flesh, Russo became the deranged Jigsaw, obsessed with destroying the Punisher and would spend years in this pursuit.